Sage Journals Online (SJO) is a discipline-specific database that provides online access to the full text of individual SAGE journals. All periodicals within SJO are distributed by Sage Publications. As of 2008, Sage Journals Online (SJO) features full-text access to 485 scholarly journals in Business, Humanities, Social Sciences, and Science, Technology and Medicine. Sage Journals Online provides access to ten collections: Communication Studies, Criminology, Education, Health Sciences, Management & Organization Studies, Material Sciences, Political Sciences, Psychology, Sociology and Urban Studies & Planning. For this review we will concentrate on the full-text collections for Sociology and Criminology. The Sociology collection from SJO provides full-text access to forty-one journals, with access differing with each specific journal; for example, Acta Sociologica is available from 1956 while access to the International Review for the Sociology of Sport began in 2007. The Criminology Collection offers full-text access to twenty-four titles going back to 1921 for the Prison Journal. A great majority, but not all of these journals, are available from the start of the publication. Sage interface is relatively easy to use. The default search is the Quick Search and it searches basic terms in the Sage Collections. The Quick Search searches article title and abstract for relevant results. The Advanced Search in SJO has many more features. SJO uses Boolean Operators to break up search terms; it also presents many options for field searching. The Advanced Search drop down menu provides over fifteen search fields to consider including abstract, key words, descriptor, full text and journal title. One can further limit his/her results by searching specific collections, all Sage content, or only content available to that institution. Additional limit options allow the user to select specific journals from a complete list and search by date range using month/year. The Browse feature allows the user to browse through the available journals by title, author, and descriptor. The final browse option is a thesaurus. The thesaurus enables the user to look up a word by searching subject matter taxonomy. 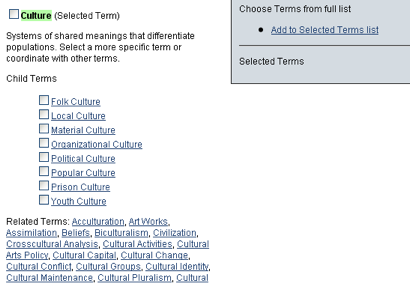 A search for culture provides the subject heading; clicking on the subject heading, one can see the definition of culture and other relevant terms (child terms to the Parent term, culture). The Search History of SJO gives the history of past searches including the limits utilized in the search. It also allows for combining searches using Boolean operators AND or OR. Users can create an account with SJO and while they are searching the last ten searches are saved for as long as they remain logged into the resource. The My Tools function has a number of specialization resources and tools available to database users. SJO provides users with three types of alert notifications via email. This alert system allows for the receipt of Table of Contents from selected journals. Users may also request notification when a particular article is cited by others. The final alert allows users to be notified via email based on an established set of criteria. Citations may be emailed, downloaded and saved to a My Marked Citation folder for later access and use. Also available is the option to transfer citations using citation management software such as EndNote, ProCite, or RefWorks. The My Favorite Journals function in Sage Journals Online allows the user to identify their favorite journals and allow for quick browsing of the table of contents. Under Managing your Account, users may change and update their contact information and password to access the My Tools resources. A side-by-side comparison of SJO and Sociological Abstracts (SA) is difficult as SJO is a full-text database while SA is mainly an abstract database with some full text. Sage Journals Online provides full-text access to forty-one journal titles from the Sociology Collection and twenty-four journal titles from the Criminology Collection while SA provides abstract access to some 2,037 journals. Of the sixty-five journals from both SJO collections, twelve are not available in the larger SA database. These eight titles for the Sociology Collection are: Australian & New Zealand Journal of Sociology; Home Economics Research Journal (now called Family and Consumer Sciences Research Journal); Political Research, Organization and Design; Race; Sociology of Work and Occupations; Urban Life; and Urban Life and Culture. The three titles not in SA from the Criminology Collection are Feminist Criminology, Police Quarterly, and Probation Journal. The coverage or access to SA journals varies based on three levels of coverage. For core journals all “substantive articles appearing in [them]…are abstracted and indexed.”1 Priority Journals are from related social sciences fields and about 50% of relevant articles appear from those journals, while Selective journals provide less than 50% of articles written by sociologists. Of the remaining forty-nine SJO titles, thirty-five are listed as core titles in SA; twelve are listed as priority, and seven are listed as selective. Sage Journals Online would be a good resource for libraries with sociology and criminology majors. SJO can be used concurrently with Sociological Abstracts for full-text articles via a link resolver and would be an excellent supplement to SA. Institutions without a sociology major but with stronger criminology studies or justice studies programs may consider SJO to be the better option. 1 Serials Source List for Sociological Abstracts, http://www.csa.com/ids70/serials_source_list.php?db=socioabs-set-c. Last accessed September 16, 2008.